Browse: Home / ROCA – Infineon RSA key vulnerability. ROCA – Infineon RSA key vulnerability. The ROCA vulnerability has been discovered by researchers at Masaryk University (Brno, Czech Republic). As two of the researchers are also affiliated with Enigma Bridge we subsequently integrated a ROCA detection tool within this test suite. It allows users of affected products to verify security of their encryption keys. This test suite provides information about the ROCA vulnerability, which is caused by an error in RSA key generation in Infineon security chips. + JSON file with moduli, one record per line, record with modulus has key “mod” (int, base64, hex, dec encoding supported) certificate(s) with key “cert” / array of certificates with key “certs” are supported, base64 encoded DER. 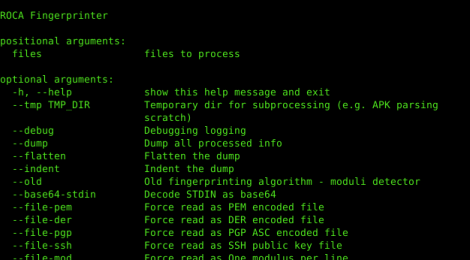 The detection tool is intentionally one-file implementation for easy integration / manipulation. ← Phishing catcher – Phishing catcher using Certstream.